. 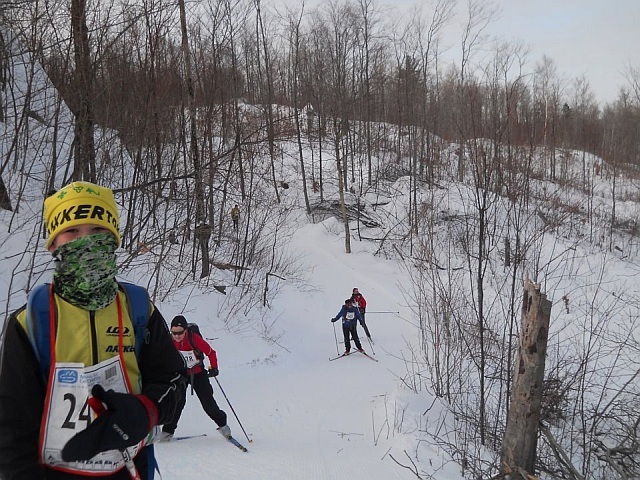 : Steve's 2012 Canadian Ski Marathon Report :: Ski XCOttawa.ca :: Skiing in Ottawa and Gatineau Park :. The Nakkertok Adventure Program had as it's big goal to participate in CSM 2012. Twenty-four Adventurers and parents stayed at the Papineauville dormitory, sleeping on mattresses in a classroom, with a few others staying in Montebello. Waxing for the CSM is a unique challenge, since due to the early start, it needs to be prepared the night before for both glide and grip. Glide wax wasn't difficult with the cold temperatures and I put on graphite, Vhauti Green, then LF4 on Thursday night. With the limited fresh snow and freeze-thaw cycles I put on an ironed on thin layer mixture of Vhauti super binder and blue klister. Crossing my fingers, I covered it with Vhauti Orange Flouro, covered by the new Vhauti K21. Right from the start we knew that we had nailed the wax, with great grip and glide. The snow conditions and grooming were spectacular with old sugary snow firmly packed, instead of the ice we had dreaded. One of the great things about the CSM, is that many of these trails are only available for this weekend to the marathon skiers, as the trail goes across many private properties. 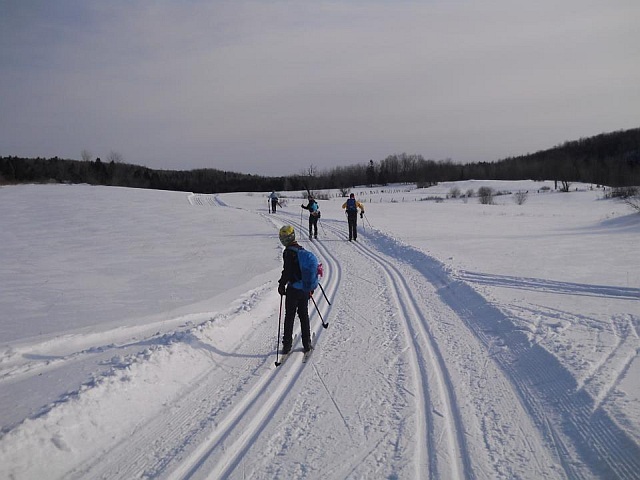 On the first day we skied through rugged forest, woodlots, rolling, farm fields and hilly terrain. The windy open sections required adding layers of clothing but frostbite wasn't a big concern. With the abrasive snow it was necessary to add a couple of layers of wax at the checkpoints, however the base held up well. Most of the Adventurers skied 2 or 3 sections, for a distance of 28km to 45km. Two of the group (including my son Patrick) ended up missing a turn on Section 8 (the third section) and skiing down a snowmobile trail for more than half an hour before being turned around by snowmobilers! For the Sunday a number of intrepid Adventurers started off on the most difficult section of the CSM, Section 3, which starts with a 260m monster hill and continues after that with many more significant climbs. The view through this section was simply spectacular. Up at the top we got passed by the lead Coureur de Bois Gold skiers, including the legendary Pierre Harvey. After skiing for over 5 hours the first day, we could feel the lactate in the legs up, and down those hills and were mighty glad to reach the checkpoint where friendly volunteers provided us with delicious lemon-honey water, soup, gatorade, cookies, dried fruit and bagels. The CSM is very addictive for the trails, scenery, challenge, volunteers, fellow skiers - so don't miss out on creating memories in the 47th CSM in February 2013! XC News: Silver Medal for XC Ottawa Men in the National Championship Relay!